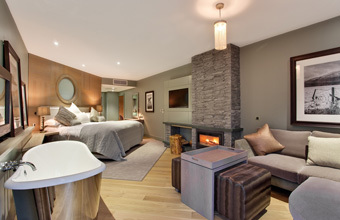 A NEW 'beyond-boutique' hotel in the Lake District is ripping up the rule book and aiming to reinvent the luxury stay. Brimstone Hotel on the Langdale Estate, the only development of its kind in Cumbria, is set to open in June and has originated from a completely blank canvas with no regard for conventional hotel traditions, making it refreshingly different. At the retreat there will be no formality, check-ins, doffing of caps, queuing for breakfast or hushed tones at dinner, instead Brimstone will offer a personalised 'couture' experience. 16 vast suites with exceptional style, huge glass walls, expansive balconies, innovative technology, real wood burning stoves and indulgent in-room spa therapies will be complemented with wine, beer, nibbles and treats on tap at zero charge in Brimstone's chic Library, 24/7. A dedicated Brimstone 'host' will see to guests' every need, from valet parking, laying the stove, mixing a perfect cocktail and serving an intimate in-room dinner for two, to sorting electric car hire, arranging outdoor kit, booking adventure activities and organising on-balcony relaxation treatments.